Look at how much I ate during my surgery!!! I was awake the whole time!! What a superbrave girl you are, Sunshade! My mom had her eyes covered the whole time and was focused on just your beautiful face. Our fingers and paws are crossed for you! Sunshade sure is stoic. I love that your vet lets you video the procedures. Helps us see and understand what is going on. I hope it is just an old lady bump. 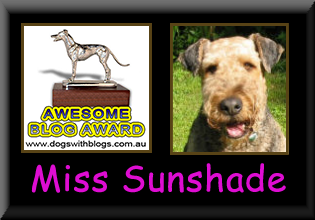 You are such a good girl, Sunshade! We have everything crossed for it to be "nothing"! Fingers crossed and paws raised to extend the circle here. We think you are truly a SUPER dale. Indeed you are a very brave girrrl!!! We have you and your mom in our thoughts and hope this is nothing serious! Sunshade, You amaze me with your Territude and love !!!!! Sending prayers and oodles of Airezen from Sweet Lily Aire Angel, Maddie and I. Hope it will come back as nothing evil. Sunshade sure is a brave girl. Oh Sunshade I had no idea this was going on...I pray that it is nothing! We love you and your Mom so much! Hi Sunshade, I just found your blog a couple days ago and have been trying to read all of your posts since! You are a very brave girl...best wishes and warm thoughts sent your way. We'll all be thinking about you, from my family, to yours..
What a little sweetheart. You light up our lives with your brave attitude. That was quite a video. We're thinking you should be a vet Elaine. You are so good with all this medical jazz!! Get well real soon Sunshade and we've got paws crossed for you. Sunshade you are just so a brave girl. We hope you are all soon better and get lots of treats. Hi E: See you could be a vet tech too.